I had an interesting email the other day from Joel who runs Papa Serra Jr. He is involved with the new Barcelona branch of EatWith whose mission it is “to bring the world together one meal at a time”. Their goal is to make it easier for people to organise dinners at home for tourists and locals while earning an income from doing it. It started in Israel and has now expanded to Spain although for now all the hosts are in and around Barcelona. This sounds like a pretty cool idea to me. There are lots of budding chefs out there that are more than capable of putting together an amazing dinner party. I can think of a few myself! And whether it be for a group of tourists or a special occasion for someone who lives locally I think EatWith Barcelona could be onto something here, providing guests with an innovative dining experience and cooks with an alternative income. 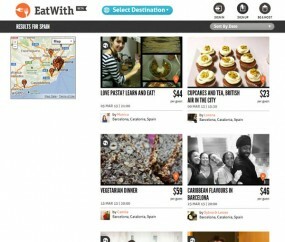 EatWith Barcelona source people for your dinners and organise all logistics. As host, you choose the menu, dates, times and price. For example, you can choose to list one event per week/month, put on anything from a single dish to a 20-dish tasting menu and have the event in the middle of the day or in the evening. And of course you select your price. EatWith adds 15% to whatever you decide. There are currently 35 hosts in the Barcelona area so lots to choose from! You can try Caribbean flavours with Sylvia & Lester, Japanese Mediterranean cuisine with Dakidaya, a true Catalan experience with Basque flavours by Xavi & Montse or go to Dani’s for Spanish food with a Brazilian twist. There really is an eclectic mix of cuisines and experiences. Create the setting in your home. 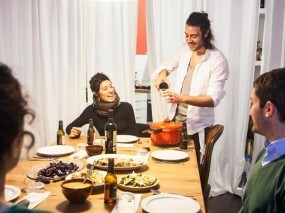 Then let EatWith send travellers to experience your cooking and conversation! What might a tourist experience when they share a meal at your house? A story about your love for Spanish food and culture. 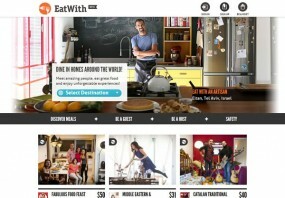 Why are you the perfect host for EatWith? Get involved and apply to host your own dinner parties! Or share if you know of someone you think might like to. Or even a tour company that might like to offer such an experience to their guests. Hola, la idea me parece interesante y en un futuro me gustaría formar parte de esta red. Vivo en el Al´Emporda en plena naturaleza. Un saludo.